I still can't see any clue about "flatness" of UT in images and video. The only thing which could possibly lead to think it's flat is the angle of the sun w.r.t the observer ("phase angle"), but I can't find this metadatum. The image looks like is illuminated from behind (Phase Angle = 180°); if it was illuminated exactly from the right (Phase Angle = 90°), then it could suggest a flat shape. The flattened shape was derived from the occulation of stars by the shadowed part, not from the illuminated surface. Yes I read that.... but as I said, I don't see any occultation which could justify a "almost-flat" object, even in this post on UMSF. I hope this is ok to post, but here is my new article on the New Horizons flyby for my HS school Newspaper, enjoy! There's going to be more information released today. NH put out a video showing the rotation of UT and promised a lot more. Nice work. I look forward to links to more articles from you. 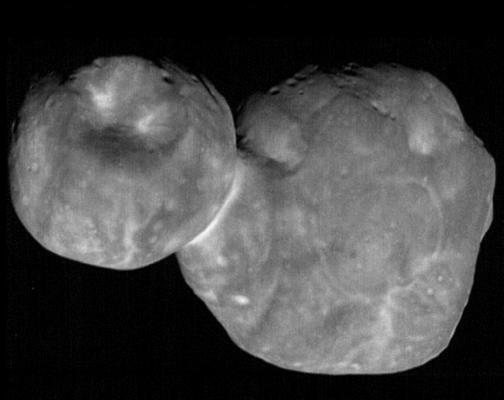 Given that Ultima Thule rotates around its barycentre and around it's thinnest axis, I'm wondering if the object's rotation is almost entirely generated by the relative momentum of the two elements when they first came into contact. It looks more and more that it was originaly one object. Thanks for the clarification as OP’s statement didn’t tally with my understanding of the object up to that point.